The shadow home secretary said the term is ‘outdated’ and ‘offensive’. The Work and Pensions Secretary says she wants to ‘level the terrain’ for disabled people. Amber Rudd, Greg Clark and David Gauke wrote in the Daily Mail, saying Brexit should be delayed, contradicting their boss the PM. Labour MP Sharon Hodgson asked about the impact of the roll-out during Department for Work and Pensions (DWP) questions. The Pensions Secretary proposed ‘wilful or reckless behaviour’ relating to a pension scheme will become a criminal offence. The Work and Pensions Secretary told ITV's Peston she can see a "plausible argument" for another vote if MPs fail to reach a consensus. The Work and Pensions Secretary also said she looked up to Katniss Everdeen from The Hunger Games. Amber Rudd believes MPs will vote against Theresa May's Brexit deal at first, but pass it on a second vote after gazing into the "abyss". 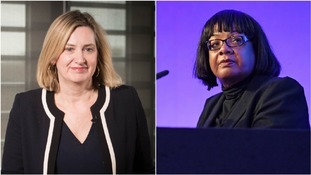 The Work and Pensions Secretary spoke at the despatch box for the first time since she resigned as Home Secretary over the Windrush scandal. 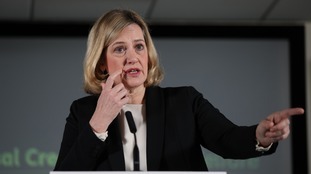 Amber Rudd said parts of the Home Office 'did not have a grip' on immigration policy.